What is meant by the term “Hand or Wrist Arthritis”? The term Arthritis denotes inflammation of a joint. Arthritis may develop over time secondary to routine joint use, which causes progressive loss of protective cartilage. Standard arthritis of the hand and wrist develops, to some extent, in all patients over time. Trauma to a joint increases the likelihood that arthritis may develop. Specialized forms of Arthritis, such as Rheumatoid Arthritis or Lupus Arthritis result from an inflammatory response to the joint lining, and occur less frequently than Degenerative or “Wear and Tear” Arthritis. At the hand, degenerative arthritis tends to affect the joints at the ends of the fingers as well as at the thumb side of the wrist, the latter is referred to as Basal Arthritis. How does Hand Arthritis present? 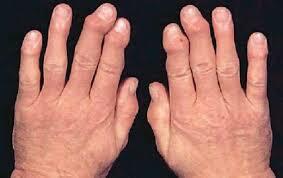 Arthritis at hand joints presents with pain that occurs with joint use. Often, aching pain persists for several hours following activities. The thumb side of the wrist is the most common site for such pain. Arthritis can also cause joint deformity due to bone destruction as well as bone remodeling. Such changes are common at the finger joints. Changes in joint movement due to deformity and pain ultimately gives rise to weakness. Arthritis is typically diagnosed through a patient interview and examination. X-rays are routinely obtained. It is usually not necessary to order other diagnostic tests when dealing with Degenerative arthritis of the hand or wrist. How is Hand Arthritis treated? Anti-inflammatory medicines and splints are the mainstay of treatment for Hand Arthritis. Hand Therapy aimed at strengthening muscles at an arthritic joint will lessen “play” at the joint, reducing aberrant movement which contributes to discomfort. Steroid injections can be provided directly into an arthritic joint when symptoms flare. When these forms of treatment are ineffective operative intervention may be needed. Surgical procedures used to treat Hand Arthritis include Joint Replacement and Joint Fusion. Arthritic conditions such as Rheumatoid Arthritis, Lupus, or Psoriatic arthritis are treated with a combination of medicines, surgery and Hand Therapy. Care for patients with these conditions requires a team composed of a Hand Surgeon, Rheumatologist, and Hand Therapist. Goals of treatment include pain relief, improved function, and limiting progression of disease. What type of physician should treat Hand/Wrist Arthritis? Arthritic conditions of the hand or wrist should be evaluated by a Certified Hand Surgeon. Dr. Steven Shoen has over 21 years of experience treating arthritic conditions of the hand and wrist. He works together with his Hand Therapist, Leah Rubino, to establish a treatment regime appropriate for each patient’s needs. Dr. Shoen also works closely with several Rheumatologists (Joint Doctors) who prescribe medications used to treat specialized forms of arthritis such as Rheumatoid Arthritis. Call Dr. Shoen’s office today at 732-632-6090, to schedule an appointment at one of his two office locations.